I’m a paranormal investigator and adventurer from one of the most haunted towns in southern England. I have also lived or worked in London, Los Angeles, Las Vegas and New York . I have been to 37 states in the U.S.A and 23 different country’s in pursuit of the paranormal. I first became interested in the subject growing up in a haunted house where I conducted my first investigation in 1976 after reading the book “Ghost Hunting: a practical guide” by Andrew Green. My equipment consisted of nothing more then a camera, a thermometer, a tape recorder, cotton thread tied around door handles to detect if someone turned them, and talcum powder sprinkled on the floor just in case the ghost left footprints. I formed my first paranormal research group in 1977 and I gave a talk at the local college about the subject, and while I have also pursued other interests in total I have over 30 years of experience in the field. And no, just because I did my first investigation almost 40 years ago, I’m not going to claim I have been investigating continually for the last 40 years like many would. Although I will work with other groups I will never become part of one which is why I choose to explore alone. This site was launched over 15 years ago. It was one of the first to take a skeptical look at the paranormal and remains independent of paranormal trends particular those of reality T.V. And for the record I have had the domain and site name Chasing Midnight since 2002 long before there was a band or book with the same name. There is a general opinion that if you believe in some claims regarding what is referred to as the paranormal but not the majority of them, then you are a skeptic. This is not the case. It simply means that you have considered both sides of an explanation, and made an informed decision that didn’t conform to that which is generally accepted by the majority. An informed decision is not the same as coming to a conclusion merely in order to comply with the opinions of everyone else. Research into the paranormal is not about if it exists, it’s about if it exists or not. Correct scientific methodology is not to prove or disprove a haunting, but to collect and assess evidence in order to create a testable hypothesis. Being a paranormal investigator should have no spiritual agenda; demons don’t exist except in the minds of those that created them. If there is life after death, it’s a biological process not a metaphysical one. And when it comes to paranormal research, we are not “all on the same side”, so why pretend otherwise. Many of the ridiculous claims and techniques that are now standard in the reality T.V driven field of paranormal investigation, agitate me. So I try and agitate back. I believe that in order for research to move forward we also need to actively seek to dispel some of the myths and misinformation that have become an accepted part of it, not remain neutral on the subject merely to appease people. E.M.F meters or digital thermometers are not ghost detectors. They have a purpose only if the readings can be proven to be linked to the appearance of an apparition. Independently they have little value. Likewise with E.V.P’s or Ghost Boxes, if you can’t prove a definitive link then your claims are invalid. The amount of equipment you have is irrelevant if you don’t know how to use it or interpret the results. Being a paranormal investigator is not just about the destination it’s about how you get there. If your journey involves reality T.V, and pictures and videos of meaningless shapes that you consider to be ghosts, then you will get there a lot sooner. However, I don’t consider this as evidence, and this site won’t be taking these or any other paranormal short cuts in order to cater to peoples false expectations. If you don’t think outside the “paranormal box”, it will become a coffin. The vast majority of “ghost” pictures are as a result of the completely unfounded theory that ghosts only come out at night and the lack of knowledge as to what can cause photographic anomalies under these conditions. But most of all it’s people’s willingness to accept almost any photograph as paranormal provided it was taken at somewhere supposedly haunted. The reality is there are just a handful of credible ghost photographs in existence, and the chances of getting another one is extremely difficult, although certainly not impossible. Instead of being disappointed by the lack of “ghost photographs” on this site it would be more constructive to question why other people think that pictures of orbs, mists, or streaks of light are paranormal at all, and where the evidence is to support such claims. Belief may not be proof, but belief without evidence is delusion. My journey is one of attempting to capture a photograph of a full apparition, as a result it may take a lot longer and perhaps it is one I will never complete. And if I do achieve my goal will this be proof that ghosts exist ? Absolutely not. But in the meantime you will get photographs, videos and trip reports along the way as I continue my international pursuit of the strange, mysterious and the unexplained. Being a paranormal Investigator isn’t about accommodating ever theory or claim, no matter how weak or questionable it is so that you have more evidence; it’s about dismissing it, until the remaining evidence is only the most credible even if as a result you have nothing. Genuine paranormal phenomena are extremely rare, crying wolf with evidence that isn’t genuine, simply undermines your credibility in the event that you do obtain what could be considered proof. How about instead of posting meaningless evidence just to fill space on your website, why don’t you try posting an explanation as to why this evidence and the equipment used to collect it is legitimate ? The views of this site aren’t dependent on those of the rest of the paranormal community and in order to remain truly independent, the site will never affiliate with anyone, or become part of any umbrella organizations or groups. I don’t believe in paranormal unity, but in paranormal individuality, where respect has to be earned, not granted without question. Am I a skeptic ? No. I may be skeptical but I am not a skeptic. I don’t attend skeptic conventions, or frequent online skeptic forums or websites or mix with them socially. I don’t even like most skeptics I find some self-righteous and that many are actually just cynics pretending to be skeptics. But that doesn’t mean that as a paranormal investigator I will ignore any useful information that they may be able to provide. Do I think it’s O.K to make money from the paranormal ? If it’s done ethically, honestly and you’re not ripping anyone off, then there is nothing wrong with making money from it. However what is wrong are over-priced ghost-hunt with a paranormal “celebrity” events, phony psychics preying on the desperate and gullible, selling ghost-hunting equipment that doesn’t do what it claims and people getting paid for fraudulent paranormal T.V shows. Have I ever seen a ghost ? This depends on what your definition of a ghost is. On July 4th, in 2008 I saw what many would consider a full apparition, it was in broad daylight for a full 15 seconds before it vanished. Is this proof ghosts exist? No. Do I have any proof of what I saw? No. Could it have been the spirit of a dead person ? Maybe. Could it have been an hallucination ? Maybe . Could it have been a mirage ? Maybe. Could it have been a perfectly normal occurrence that science hasn’t yet explained ? Maybe. Could it have been a projection from a U.F.O flying high above the desert ? Maybe. Could I be lying. Of course. (I’m not, but I have no proof that I’m not) And that is the problem with ghosts. Do I ever watch paranormal T.V and do I dislike every paranormal T.V show and paranormal celebrity ? Yes, I do watch paranormal T.V, and no I don’t dislike every paranormal T.V show and paranormal celebrity just the vast majority of them. However I do believe it’s possible to have a paranormal T.V show which is both entertaining and could genuinely further paranormal research instead of eroding the credibility of it. It may mean that they dont get “evidence” every show (or ever) but neither does the current crop of paranormal T.V shows, they just pretend they do. Would I ever appear on paranormal T.V ? No, not if the format was the same as the majority of the current shows. I would never be that desperate for money or fame. I got to visit all the places I have been to so far without having to compromise my beliefs in any way. A T.V show should be a bi-product of your research not the aim of of it. However if there was a show that followed basic scientific investigation protocols (rather then just claim that they do) didn’t mislead the public, and didn’t make unsubstantiated claims just for ratings then yes, absolutely. So do I have a better pitch for a paranormal show ? Yes, I do. I’m not just going to criticize everything without having a viable alternative. I have nothing against paranormal reality T.V just bad paranormal reality T.V. The latest paranormal reality T.V fad seems to be people investigating haunted places alone. There is nothing ground-breaking about this. I have been doing it for years. I also have a date-stamped pitch from almost 7 years ago for exactly this premise which I have never submitted to any production company due to the abysmal state of paranormal T.V and many of its viewers. The term paranormal means: “Beyond the scope of normal objective investigation or explanation”. By definition this covers a very wide range of subjects from ghosts, U.F.O’s and monsters to haunted places and I don’t feel bound to just one standard interpretation of the word, but will deal with as many of these subjects as possible. To chase means to pursue, midnight is a time associated with the paranormal and mysterious. Chasing Midnight refers to the pursuit of the paranormal. You will get exclusive videos, trip reports and photographs of locations that I have visited all over the world. I am not an armchair paranormal investigator. These are not second hand accounts, but places that I have sought out as someone genuinely interested in the paranormal. Whenever possible in order to add to the atmosphere, I have visited these locations by myself and at times when few, or no other people were around. As a paranormal investigator I have conducted night time investigations at many of these places, and I will also be including these reports if a case is of particular interest or I actually capture some evidence during my time there. But contrary to popular belief the amount of paranormal occurrences during the day are equal to those made at night, and due to the greater visibility during the daylight hours videos and photographs taken during this time are actually more interesting visually, which is why this site places a greater emphasis on them. If you are a paranormal investigator you should know there is little scientific basis for the belief that ghosts only come out at night, and it is far more to do with a mythical association created as a result of horror movies and “scary stories told around campfires”. I have no hidden agenda, however I will also do everything I can to publicize this site in order to further promote my research and opinions. The only thing about publicity-seeking that is unethical is if you pretend you are not doing it and it becomes your primary objective above everything else. But please note that although at the time of writing this site has reached 30 million hits, it would still be far more popular if I wrote about the virtues of paranormal T.V and its stars rather then criticizing them. And if I remained neutral with my opinions in order to appease people and just blindly followed along with the paranormal masses. I have never had adverts on the site as I refuse to endorse anything which I don’t support which would invariably mean including adverts for psychics and paranormal T.V shows. I have nothing to gain from simply creating inflammatory articles in order to generate revenue, but I will never be neutral in regard to the paranormal but will always actively seek to dispute the many misconceptions regarding it in order to better substantiate the claims that may be genuine. Hey Buddy!, I found this information for you: "Paranormal Investigator And Adventurer". 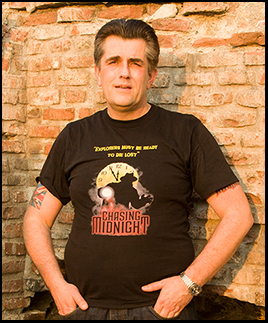 Here is the website link: https://www.chasingmidnight.com/paranormal-investigator. Thank you.